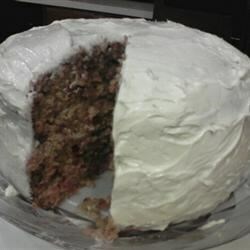 "This cake is simply great with the odd ingredient of beets. It goes in the oven pink and comes out a nice rich beige color. It's a great way to use up those extra beets you have from your garden. I often ice it with a cream cheese icing." Preheat the oven to 350 degrees F (175 degrees C). Grease a 9x13 inch baking pan. In a large bowl, mix together the vegetable oil and sugar until well blended. Beat in the eggs, one at a time, then stir in the shredded beets and pineapple with juice. Combine the flour, baking powder, baking soda, cinnamon, allspice and salt; stir into the beet mixture until just incorporated. Spread the batter evenly into the prepared pan. Bake for about 45 minutes in the preheated oven, or until a wooden pick inserted into the center comes out clean. When cool, frost as desired, or eat plain. This cake is awesome and a great conversation piece!!! The cake a much, much better with raisins so I highly reccomend you add a half cup raisins.